These words from No Man’s War: Irreverent Confessions of an Infantry Wife (Counterpoint, 2014) by Angela Ricketts, ESME’s Military Families Resource Guide, convey Ricketts' candid and poignant voice. Her memoir explores the experience of being left behind to raise her family while her husband served eight long deployments. Ricketts is knee deep in writing her second book and promoting No Man’s War, including an interview with NPR’s Fresh Air host Terry Gross—and ESME is fortunate to have her serve as our Guide to Veteran’s Assistance/Military Family Resources. Q: How did you came to be a Solo Mom for a series of seasons? 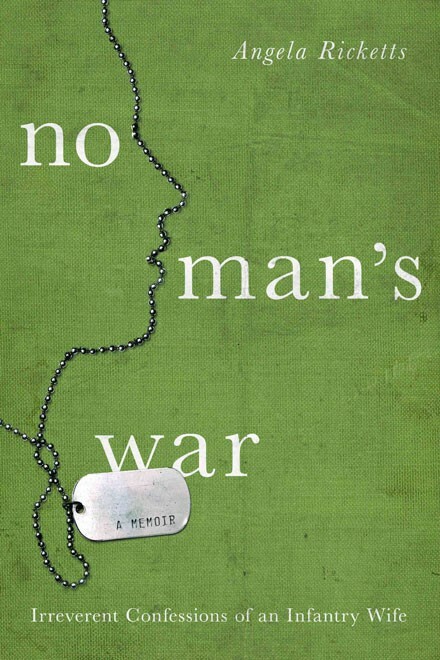 What inspired you to write No Man’s War? A: I didn’t necessarily choose to be a serial Solo Mom, but it’s the way the chips fell in my life. My husband is an army infantry officer, and we happened to have two very young children when the war began in 2001 and a third child a few years into the war. I was inspired to write my book after a heart attack I had in 2010, despite the fact that I had never smoked and was 41 years old and in great health. Suddenly I became keenly aware of the toll of not only a decade of war, but a decade of solo parenting. At that point, he had been gone at a fairly steady pace of about every other year since 9/11, more or less. When I had the heart attack, he was three months into a year-long deployment, his third deployment to Afghanistan. We made the decision for him to finish the deployment with his troops in Afghanistan, but we agreed that would be his final of eight deployments since his first to Somalia in 1992. In practical terms, he’d been gone for about half the lives of our two eldest children and about two-thirds of the life of our youngest. Although he missed so much “boots on the ground” with family, he did an excellent job of making the most of every minute he had at home with the kids. Even still, having him around was more of a novelty to us than our normal. After my heart attack we knew we had to make some lasting changes to that hypervigilant mode of back-to-back deployments. Q: That had to be a Solo Mom nightmare—a heart attack while your spouse is deployed. Could you share what happened and how you coped? A: To this day, cardiologists are not sure why I had a heart attack. Women present so differently than men. My heart attack happened in the middle of the night, and I experienced classic symptoms (chest pain, nausea, dizziness, back pain, sweatiness), but I tried to tell myself it was a panic attack. Remember, my husband was three months into a yearlong deployment in Afghanistan. When my left shoulder started to hurt, I went to the hospital. Yes, I drove myself. I didn’t call 911 because I didn’t want to draw attention or put anyone out. Women are conditioned to think that way. I had the support of my close-knit family who lived a few hours away, and most importantly, I had the support of a tremendously strong group of other army wives and Solo Moms during my recovery. Q: The romantic notion is that when a partner returns from being away for a long period of time the reunion will be wonderful and passionate. The reality is usually much different. What tips would you give someone to avoid burning up on re-entry? A: The honeymoon period last anywhere from a few hours to a few days. The reality is that coming home doesn’t solve every problem and make everything better. It’s an upheaval. Redeployment is something that both the soldier and the family spend a year or more looking forward to, and it can be a letdown. So my advice would be to lower those expectations of a perfect reunion. Allow yourselves time and space to get to know each other again. None of us are unchanged over the period of a long deployment, something to be mindful of. Q: What challenges have you faced in writing about your children? A: Using the term our is an effort on my part. “My children” comes more naturally; I have to make an effort to remind myself these are “our children.” I’m not alone in parenting, at least not in theory. In reality, yes, I was mostly alone back then. Q: Raising three children through numerous deployments had to be difficult; however, there is very little mention of your children in your book. Was that a conscious choice? How has your family situation affected your children? A: I didn’t write much about my (OK, our) children because I didn’t think it was fair to them. They didn’t choose this life. There’s been a big focus on the kids’ resilience and the impact of this on them. The truth is, I don’t know. I do wonder how they will describe their childhood someday. This life is all our kids know, their friends have been through the same or similar experiences with deployed parents. That’s a good thing. This is their normal. Q: Your memoir doesn’t shy away from discussing other military spouses and to a lesser degree, certain military members, in unflattering terms. Has there been any personal backlash caused by the book? What about professional ramifications since your husband is still on active duty? A: Sure, you can’t please everyone. This is my story and no one else’s. Certain characters in the book would likely have written it very differently. As far as personal backlash, all I’ve gotten is some nasty Amazon reviews by folks using pseudonyms who admit to not even reading the book. My husband has only gotten kudos! It’s crazy. We both expected a lot more angry responses, but those cases have been isolated. The response we’ve gotten from our usually tight-lipped subculture has been overwhelmingly positive. Before media or lectures, I often re-read my book to refresh my memory. Each time I cringe a little bit at how angry I was. I’m not an angry person by nature but NMW is a snapshot of a period in my life. And I was angry and exhausted. Q: A very moving part of the book is when your friend’s husband dies in a helicopter crash in Afghanistan. It shows the possibility that in an instant you can shift from sometimes–Solo Mom to permanent–Solo Mom. Could you speak to the impact such a death has on the sisterhood of military wives and the harsh reality that once a military wife is widowed she no longer stays on post? A: Thank you for asking this question. To me, it’s one of the most important themes of the book. Military spouses identify ourselves through our spouse, and if we lose that spouse to death or divorce, a huge chunk of that identity goes out the window. The impact of that loss cannot be underestimated. It’s devastating. We rely on that sisterhood to hold us up. So in addition to the tremendous grief and horror of losing a spouse, the eventual paradigm shift of identity is not discussed enough. Most widows leave the military community fairly quickly after the death of their service member, but for others it takes some time for them to figure out an identity beyond the military. A transition from military to civilian community is tough enough without factoring in the loss of spouse. The widow I wrote about stayed on post for a year while she figured out where to go and what to do. That was certainly longer than average, but it’s what she needed. So many times during that period I put myself into her shoes and realized how lost I would be without calling myself an Army wife. That would have felt like a slap in the face to me, having a huge piece of myself torn away by the system, even though I would have realized that it only made sense that I needed to move on. Knowing and accepting are different things. Military spouses "hitch their wagon" to their soldier. We're lost without our wagon. Something interesting about the sisterhood is how protective we are of those who have paid the greatest price, particularly our widows. I was reluctant to even write about that tragedy because I wanted to be sensitive of her feelings and reaction. But I wanted to include that chapter because I thought it painted a reality of our lives that the public never really sees. I included her in the process of writing the book and allowed her to read and alter anything that referenced the death of her husband. Of any content of the book, that’s the only thing that makes me feel uncomfortable discussing in interviews because I still want to protect her feelings and privacy. I hope the portrait I painted of her honored her grace and struggles as both a new mother and also a new widow. She continues to be a strong voice of advocacy in our community. Q: What does the army get right for military families during deployments? What could they do better? What can the military do to support National Guard and Reserve families who don’t have the ready support of a base/post available during deployments? A: I can’t criticize the military over the course of this war. No one knew how long or how intense it would be. We were all taking it one day at a time. Active duty families who live near military installations had many resources in terms of child care and general support, but now that the war is ending those are being taken away. Reserve and National Guard families have my utmost respect. I have no idea how they managed to cope. I couldn’t have endured what we endured without the safety net of the Big Green Machine. Q: Elizabeth is one of the few Army wives you speak highly of. You mention that the fact that she has outside employment may be what sets her apart from the others. Do you think the Army should do more to encourage and facilitate employment/careers among military spouses? A: I don’t think it’s the army’s job to encourage spouses to have outside employment. That’s an individual choice. The truth is that it’s hard to find a career that is mobile enough to withstand our nomadic lifestyle. I was fascinated that Elizabeth was able to maintain her own identity. There are many others like Elizabeth; I just used her as an archetype for those army wives who forge their own way. I did not have a career during those years and was a full time mother, and I wouldn’t change a single thing. Somehow the perceived negative characters in my life stuck with me. The positive characters far outweighed the negative, but it's not fun to read about roses and rainbows, is it? Q: What’s next for Angela Ricketts? A: ESME, of course! I've been doing a lot of media and lectures about the experience of families during wartime and that's been very rewarding and personally cathartic. Also, I am in the early stages of putting a book together.